Hatters boss Nathan Jones believes midfielder Alex Lawless has put the decision to substitute him during the first half against Newport County last weekend firmly behind him in training this week. 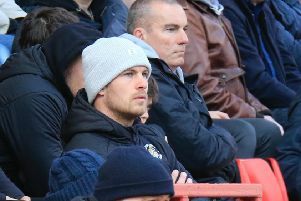 The 31-year-old, who is out of contract at the end of this season, was replaced by Cameron McGeehan with just 29 minutes gone at Kenilworth Road, thumping the dug out in frustration after taking his place on the bench. But speaking about his response this week, Jones said: “I’ve spoken to Alex, given him time to cool down, because I’ve been there myself. “Micky Adams pulled me off after 20 minutes and I was probably playing a lot better than some of ours were on the day. “But he’s accepted it, reluctantly, and rightly so, as he is disappointed, but he’s a good pro, we’ve had a good week and it’s in the past. “I knew I’d get that from him and it’s not a personal thing because he’s played most of my games here and I like him. “He’s from my village back home, so I’m not going to victimise him in any kind of way. If anything you’d think it was a little bit nepotistic in how I look after him, but it’s one of those things. On just why it was Lawless who he decided to withdraw and not Pelly Ruddock Mpanzu, who had been struggling in the opening half hour, or Olly Lee, Jones added: “It was a thing I felt I needed to do. He was very unfortunate because after looking at it back, he was neat, he was tidy and so on, it’s just the urgency that we didn’t have in our game. “He’s one of the reliables ones, so at times, you accept it from people that are not as consistent as him, but he’s in the team because of his consistency, because of how regular he is in how he does his job. “So if he’s off, then it’s difficult to see what he’s really going to give you then and that was what was disappointing with Alex because he’s been superb, been the steady one, keeps things ticking over, does all the good things.